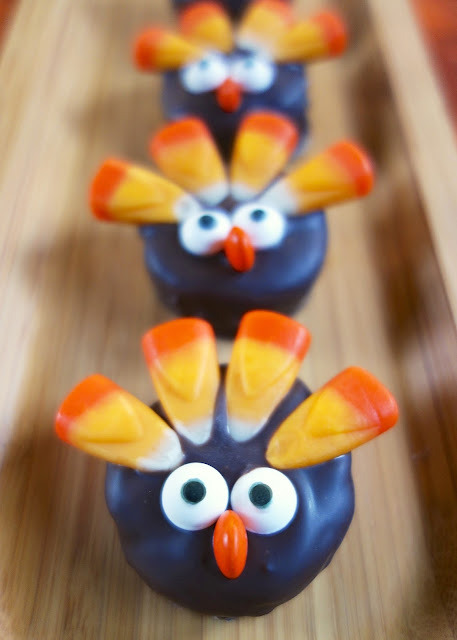 Oreo Cookie Ball Turkeys - adorable no-bake Thanksgiving treats!!! Mix together cream cheese and crushed oreos and decorate with candy corn, mini M&Ms and candy eyes. Great treat for the kids to help make. SO fun! Perfect for your Thanksgiving meal! Thanksgiving is a week later this year, so I have been busy baking up a ton of Thanksgiving desserts. I am going to share several desserts with you this week. 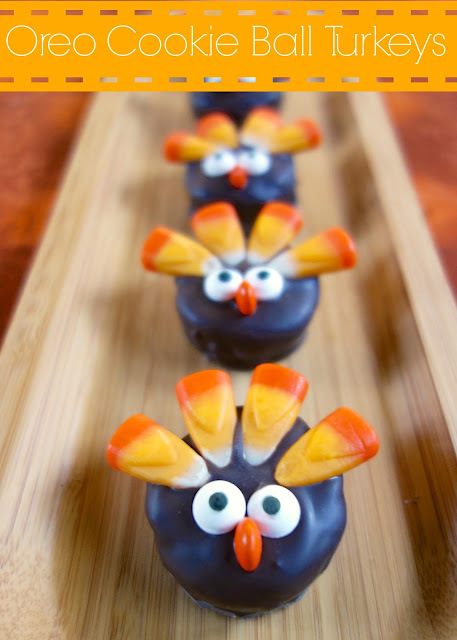 First up are these super cute Oreo Cookie Ball Turkeys! These are one of the cutest things I've ever made. They are also super easy! I mixed up the Oreo Cookie Ball mixture and then pressed the mixture into a mini muffin pan. Once they were firm, I decorated them like turkeys! They were almost too cute to eat - almost. Give these a try this holiday season. I promise you that kids of all ages would welcome these at the Thanksgiving dessert table. Mix cream cheese and cookie crumbs until blended. Press a heaping tablespoon of mixture into each opening of a mini muffin pan. Refrigerate an hour, or until firm. Dip balls in melted chocolate. Immediately place 4 candy corn pieces point down sticking up from the cookie ball to make the turkeys feathers. Place two eyes on the face of the turkey. Place mini M&amp;M on its side in between the eyes to make the beak. Repeat with remaining cookie balls. I HAVE to pin these!!! These are so cute and I'm sure kids would have fun helping me with these! These turkeys are so cute. I have made these balls before but now I will try to decorate them as turkeys. My family will get a good laugh. Thanks for the idea. So cute! I know the big and small kids in my family would love them. What a fun and festive recipe! These are super cute, love how fun they are! I saw these on Pinterest and I think they're incredibly cute. Thanks for the idea Stephanie.